Melvin Seals and JCB will perform tomorrow, Saturday November 16 in the Crown Room. Special guest, Orgone, will also perform, and Terraplane is the after-party. The show starts at 9pm in the Crown Room and tickets are $22 in advance and $25 at the door. 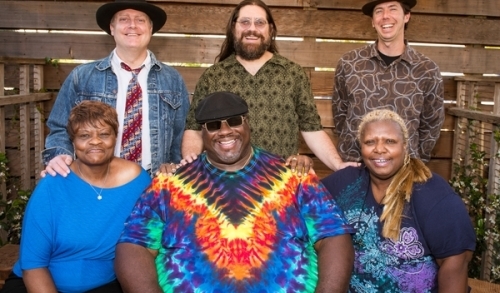 The band includes Melvin Seals, Shirley Starks, Cheryl Rucker, Pete Lavezzoli, and Dave Herbert. Melvin and JGB brings an intuitive, expressive style, soul, spontaneity and remarkable chops to the table. With acoustic and electric ingredients and unique combinations of Dave Hebert’s guitar and vocals, Pete Lavezzoli’s hearty drums and, of course, a heapin’ helpin’ of the wizard’s magic on Hammond B-3 Organ and keyboards. Along with backing vocals, the result is a most satisfying blend of natural organic grooves that challenges genre boundaries. Their chemistry is the focus from which they create a spontaneous and high art where the sky is the limit musically. They offer an exciting, often psychedelic musical journey that changes nightly and keeps the audience dancing and smiling (and some staring in amazement) for hours.